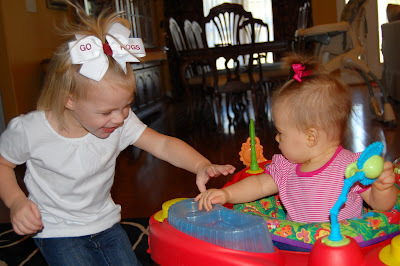 Check out M.C's Pony Tail! 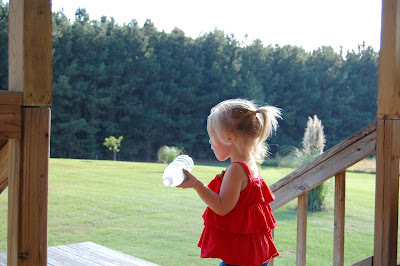 Micah Claire finally has long enough hair to pull it back and make a REAL pony tail! Here it is!!!!!!!! Isn't it CUTE!!!!!! 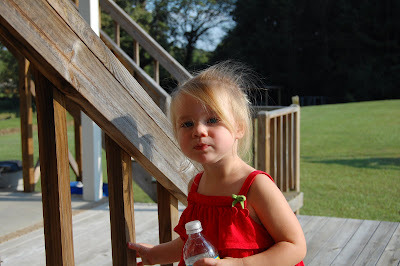 And her bangs are almost long enough to stay back too! 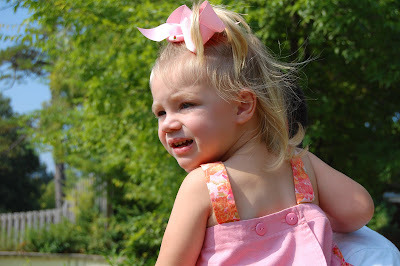 Yesterday Cadie Belle came and spent a few hours at the Cowart house. 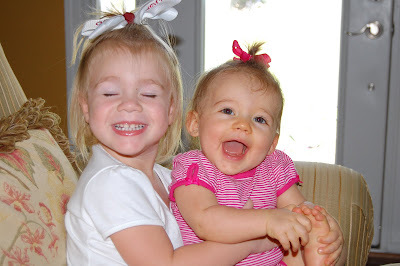 Micah Claire is totally in love with Ms. Cadie. 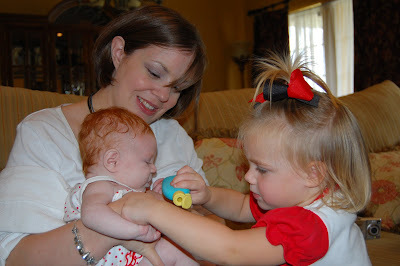 She loves to help mommy feed her, change her, and entertain her. One time Cadie got really upset. 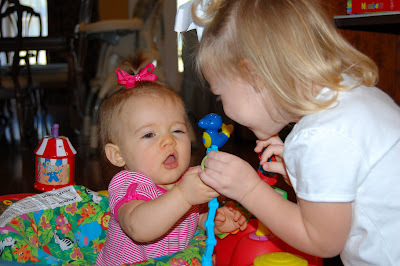 Micah Claire said, "uh oh mommy, Fix her!" It tickled me to her M.C. 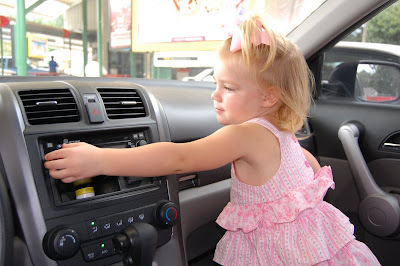 say "fix her," too cute! 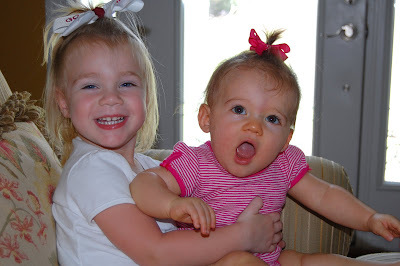 Micah Claire was soooo excited that she FINALLY got to hold Cadie Belle all by herself (Don't worry Ms. Shannon, mommy and daddy were SUPER close by!) 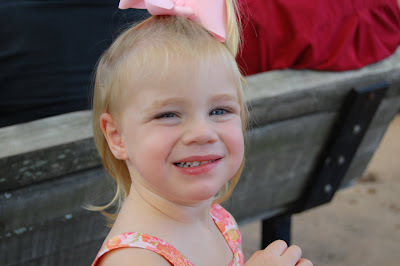 Cadie Belle's precious smile! 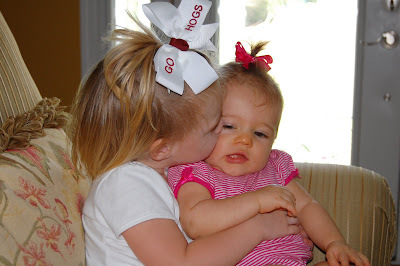 And Sweet Smooches for Cadie Belle! Thursday afternoon Georgia Kate (or Cake as M.C calls her) came by for a visit. 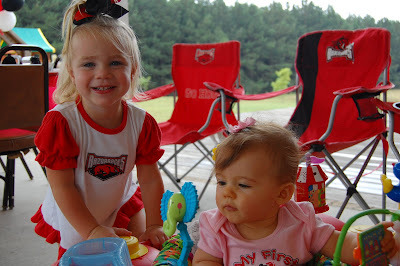 Georgia was sick during Micah Claire's birthday party so she wanted to bring M.C her present. 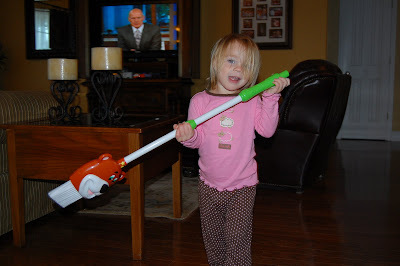 She got her a super cool broom that talks and sings. M.C loves it! 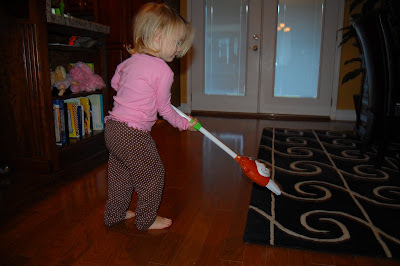 Micah Claire showing off her new fancy broom! My new little maid! 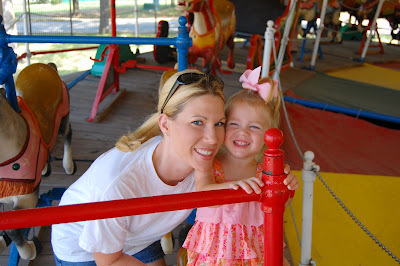 Mommie and MC's Saturday Together! Daddy spent the weekend at deer camp so me and Micah Claire had an entire Saturday to ourselves. Our day was jammed full of fun. 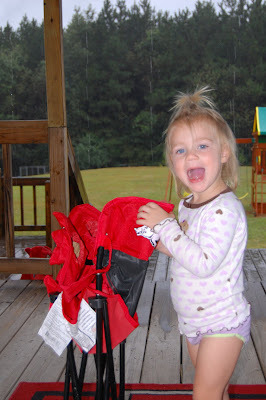 We started the morning out with Micah Claire's new favorite thing, her Ray-tor-back (as she says) chair. Ms. Brenda and Mr. Jim got her this chair several weeks ago; but we didn't give it to her till her birthday. She absolutely loves that she has a chair just like mommy and daddy's. 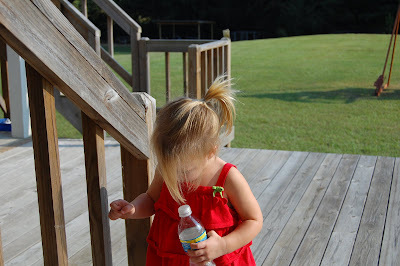 And she loves that it's small enough that she can carry it around and open & close it all by herself! Thanks Brenda and Jim! 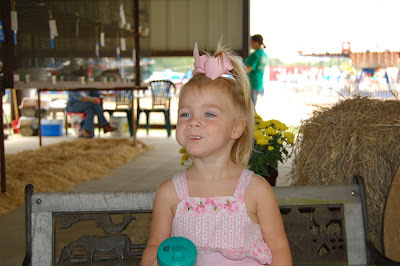 Then after a 2 hour nap we went to the county fair. 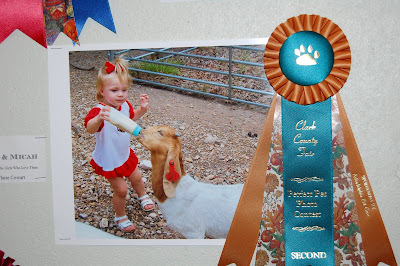 My dad entered her and Legend's photo in the cutest kid and pet photo contest. She won second place! 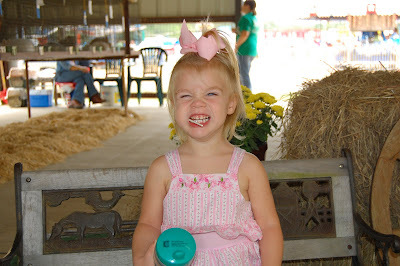 She was so excited to she her picture and her BIG ribbon! 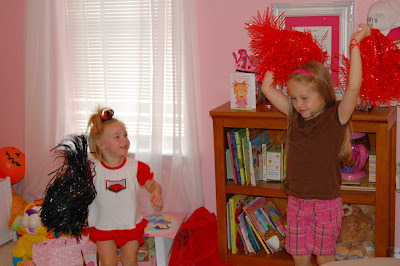 I personally think they should have one first place, but I may be a little biased! 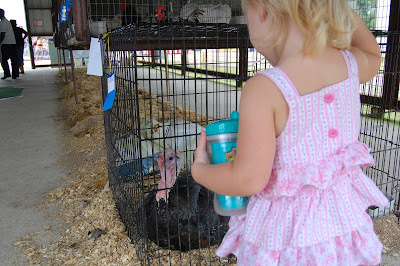 She loved seeing all the animals; especially the turkey and the roosters. Too much going on to give mommy a real smile. 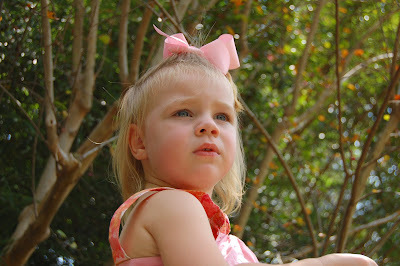 Again distracted by the roosters! 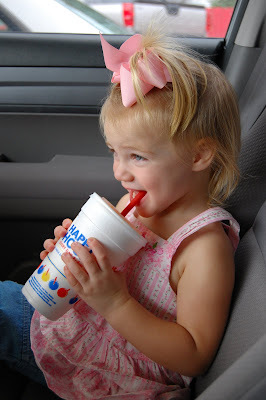 Then we made our happy hour trip to sonic for her favorite, a Orange Slush! 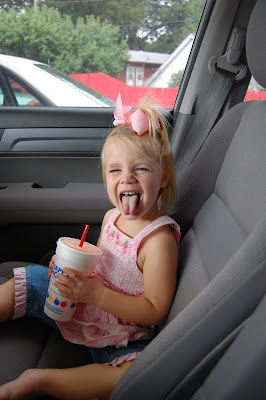 She loves to sit up front turn, up the music, and wait for her icee! 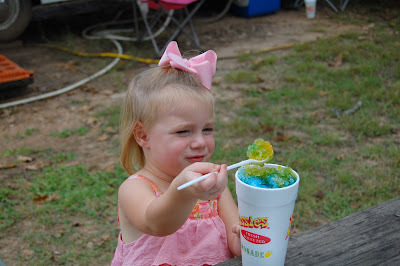 And finally her orange slush arrived! 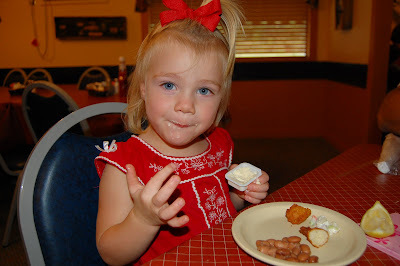 Then we went to dinner with Papaw and Ms. Debbie. 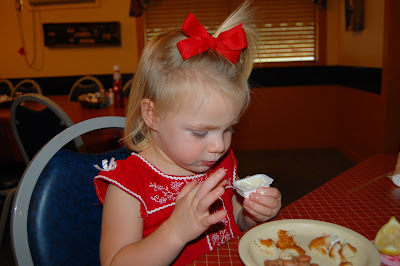 To say my child LOVES butter is a true understatement. It's just about all she will eat when we got out to eat. Good Stuff! 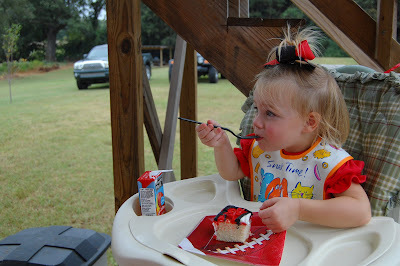 Today we finally got to have Micah Claire's 2nd birthday party. I was EXTREMELY worried that it was going to get rained out. But we got lucky and got hardly any rain! 30 minutes before the party started M.C. got a very special delivery. 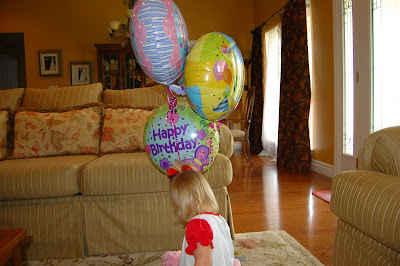 Aunt KayKay, Ben, and Amy Jo sent her some balloons with a pink teddy bear and some candy. M.C. 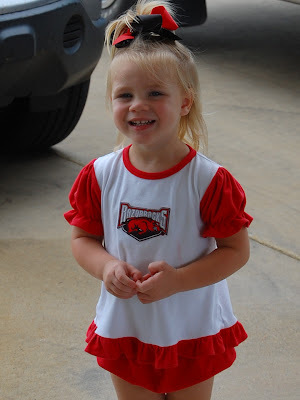 and her Cadie Belle! 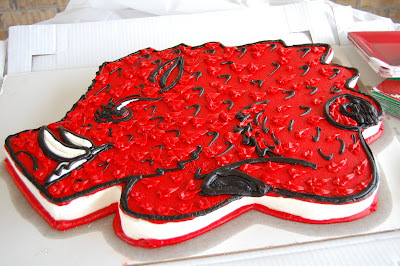 Here is her SUPER CUTE Razorback cake. Greg did an AWESOME job on it!!!!! M.C. 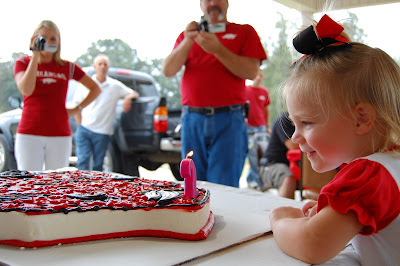 trying REALLLLLLLLLY hard to blow that silly candle out! 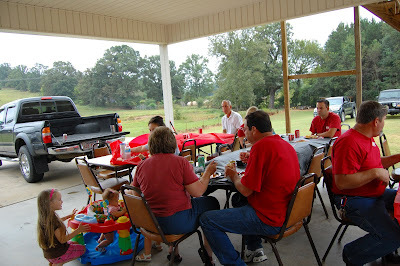 Good food, good family & friends.... just doesn't get any better I tell ya! 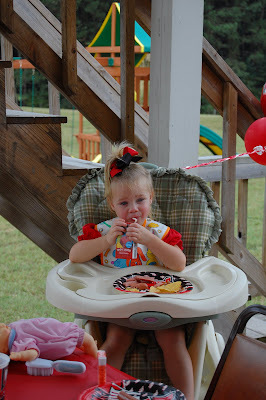 Micah Claire finally got to eat! 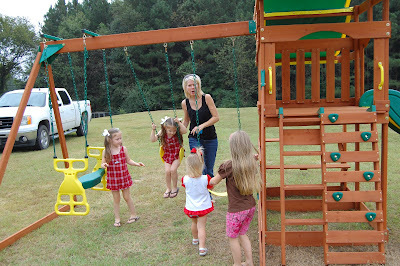 I was glad it didn't rain and the kidos loved playing on M.C's park! 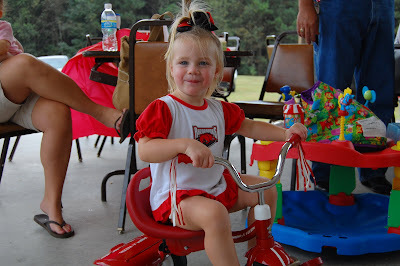 Poppa Stan got her a new shiny red tricycle. 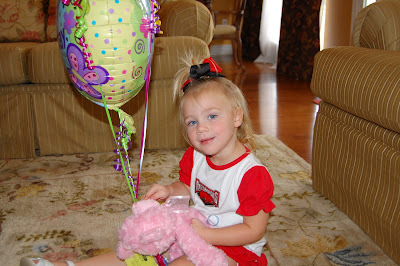 She had a blast opening her birthday gifts. 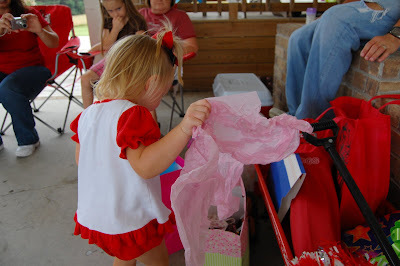 She got some wonderful gifts! 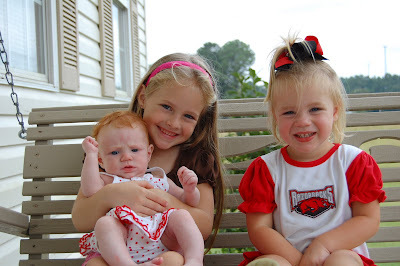 Emily, Maddie and M.C; The 3 Cowart Grand-daughters! M.C. giving Maddie a pretend bath! 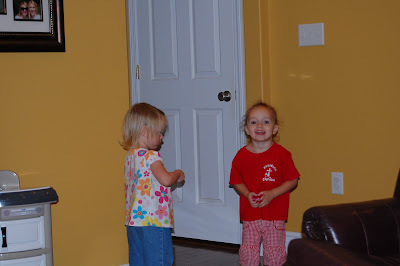 Some how these 2 found the energy to come inside and do a million flips! We partied for almost 4 hours. 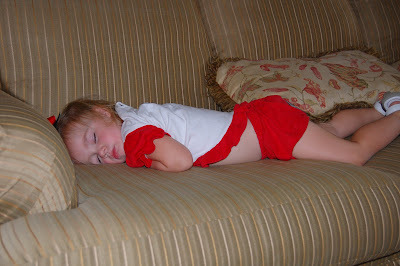 Then Micah Claire passed smooth out and took a 3 hour nap. Now that's the true definition of partying hard! 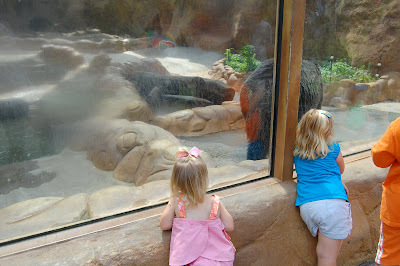 We decided to spend Labor day at the Little Rock Zoo. 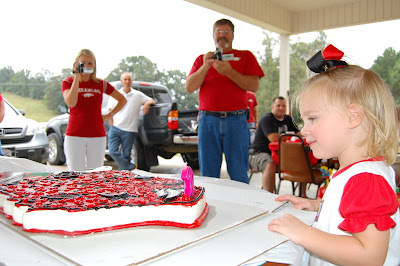 Micah Claire had a great time! 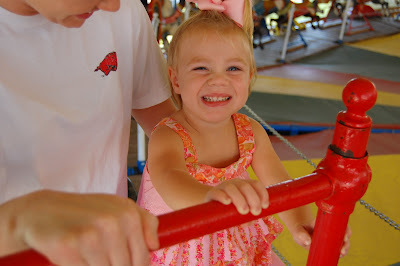 This was her very first time to ride the carousel. 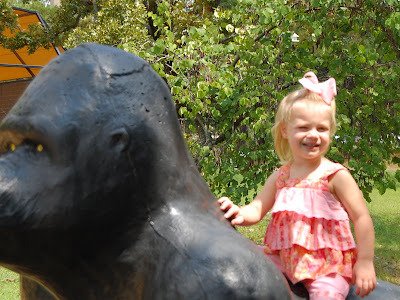 She was super excited about riding it till it started moving. She quickly decided she wanted "OFF MOMMA!" 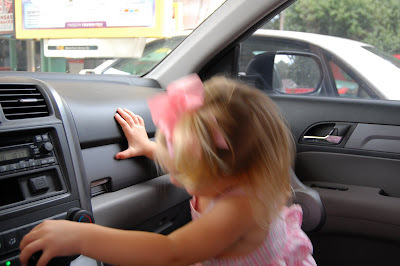 But we managed to keep her on there for the entire ride. 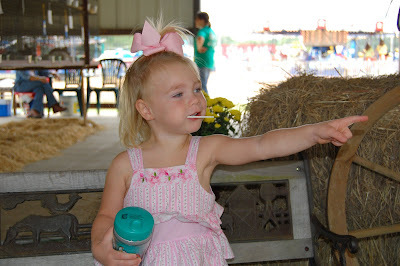 We asked her later in the afternoon if she wanted to ride the horse again and she told us NO! 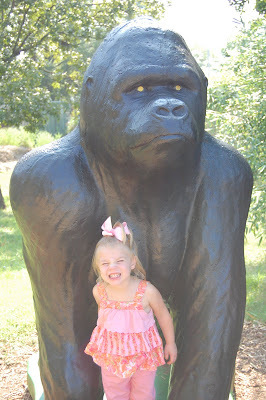 And of course we had to stop and make some pictures with the big monkey! Yep there's that cheesey grin yet again.....urrr! 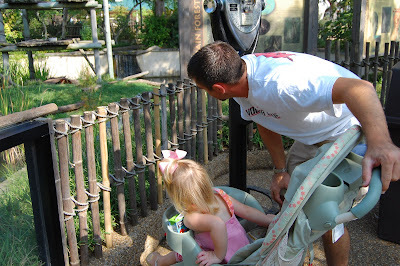 Here she is checking out those monkeys; her favorite! We decided to attend the special bird show they were having. It was very interesting but 25 mins is just too long for 2 year old to sit. 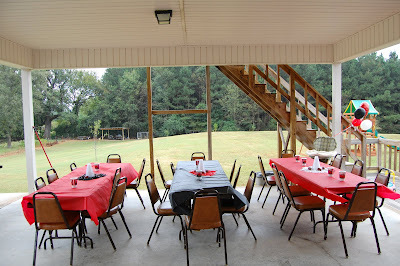 Of course the speaker kept having to tell the parents to make their kids have a seat since the birds were flying overheard. 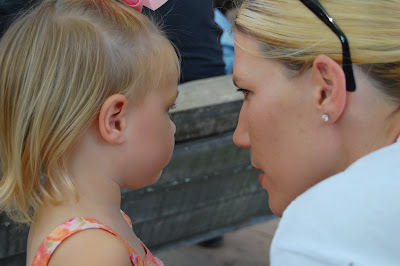 So, this is me trying to explain to my very impatient 2 year why we have to sit down and be very still. 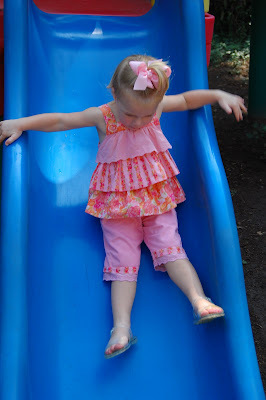 And we had to stop and play at the little park. I think she would have spent all day there if we would have let her. 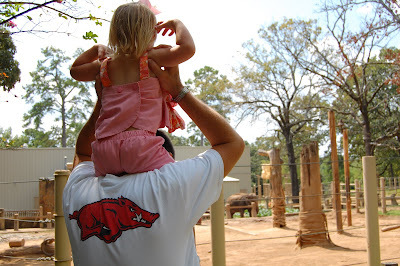 Daddy gave her several boosts to see all the animals; daddy got quite a workout this day! 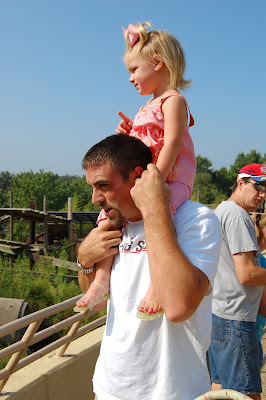 Checking out the elephants via daddy's shoulders! This bear gave quite a show. He sat right in front of the glass. The kids loved it! 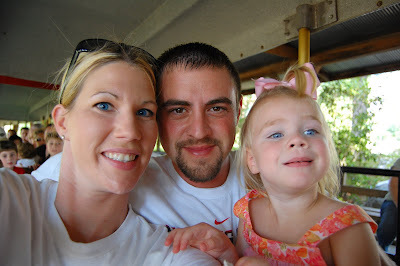 And just had to take a family train ride! Cho Cho!!!!!!!!! 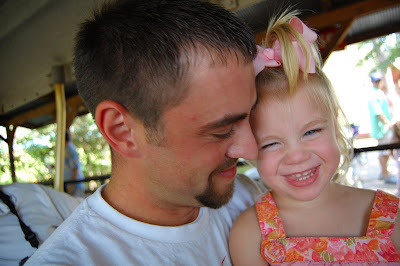 Isn't this the sweetest picture! 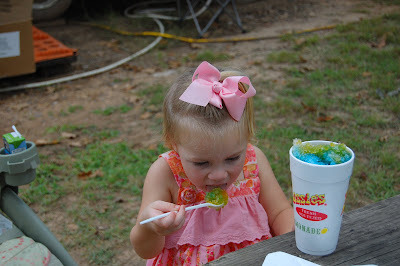 And who can go to the zoo without getting a shave ice; or as M.C calls it icee! Now that's some serious concentration going on there! 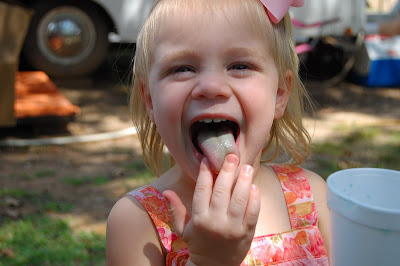 And of course she had to show off her blue tongue! PRICELESS!